The bag of rubbish thrown from the van that was returned by the German cyclist. Screenshot from Mr Schuengel’s video (watch below). A German living in Manila pursued a van on his bicycle to return a plastic bag of rubbish that had been dumped onto the street. 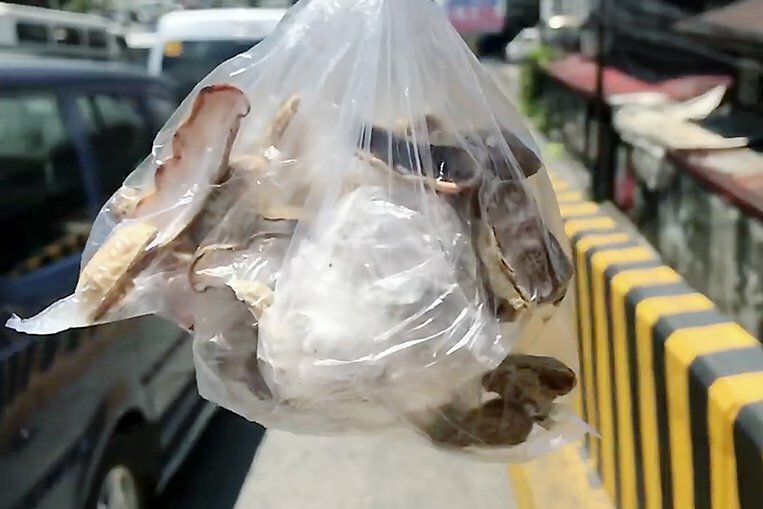 Frank Schuengel, an e-commerce executive, said he was aboard his bicycle on the Makati-Mandaluyong Bridge when he spotted the plastic bag being thrown from a window of the vehicle. Writing on visor.ph on Friday (April 12), he said: “The other day, I was cycling to work when the passenger of a van in front of me decided to discard a small plastic bag full of rubbish by simply throwing it out of his window and onto the street. The footage has since gone viral and drawn widespread praise for his actions. He has since said: “As flattering as everyone’s reaction is, the pollution problem in this country won’t be solved by one bloke on a bike. It will take all of us to make a difference. He also responded to some commenters who had expressed embarrassment that it took a foreigner to take action while Filipinos continued to pollute their own country. He wrote: “The ‘foreigner’ factor no doubt helped the video go viral, but humans either pollute or clean up regardless of the passport that is in their pocket. On Friday, we reported on another foreigner living in the Philippines tackling the nation’s waste problem. Marine biologist Darrell Blatchley drew widespread support when he began cleaning the streets of his neighbourhood in Davao. Last month Mr Blatchley, owner of the D’ Bone Museum, made headlines across the world after he pulled more than 80 pounds of plastic waste from the stomach of a whale during an autopsy. Bravo Mr. Schuengel , everybody should be doing this.